The bold adventurers three: Fletch, Gregicus and Grendig arrived by boat to the pearl of commerce, Alltrade. A missive, offering to hire them for adventure, had been sent to them by the ancient sage Koar the Blind. Upon reaching Alltrade the three were quickly directed to Koar’s estate and welcomed with great hospitatlity. 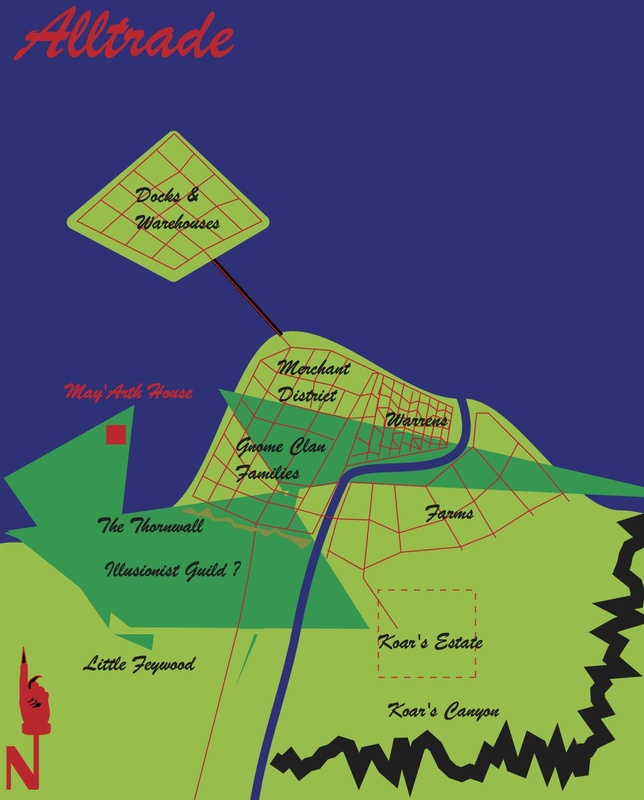 Koar wanted Fletch, Gregicus and Grendig to explorer Durgeddin’s fallen mountain fortress, Khundrukar, the Stonetooth over the ruins of Glinder. The kindly sage dispatched them with a scrying crystal should they need his assistance. The three spent the rest of the day securing provisions, mounts and magical items. The local priest of Norbask’Kun, Sister Alonsa, supplied them with several healing potions. They also visited Vistain’s Shoppe of the Wonderous where they acquired a floating glow rod and a sentient silk line. After finishing their provisioning, they returned to Koar’s estate and spent the night. The brave explorers rode west in the pleasant summer morning. The day was mostly uneventful except for a brief encounter with a green-eyed tiger the size of a water buffalo. Fletch managed to startle the tiger with a clever illusion. That would have been the end of it except for the growl that sounded like “vvveeerrryyy fffuuunnnyy”. That night Grendig spotted two great green orbs—watching and waiting in the rainy darkness. The rest of the trip was uneventful, the party reached the Stone Tooth at dusk, the sharp mountain that houses Khundrukar. A single pillar of smoke rose from somewhere on or in the mountain. 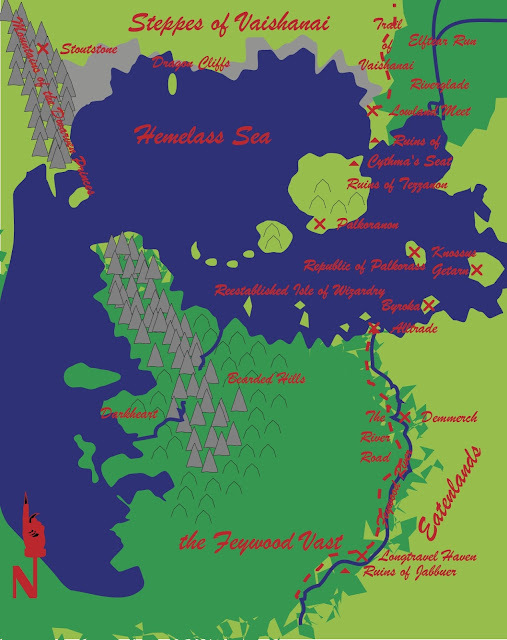 The party set camp and hobbled their horses to the North of the Stone Tooth near the Glinderrun. The night passed without incident.